Autochrome Lumiere was the most popular way to take color photos in the early 1900s. The Lumiere brothers patented Autochrome Lumiere photography in 1903 and held their first demonstration in 1907. The process involves light passing through glass plates covered in tiny grains of colored potato starch. 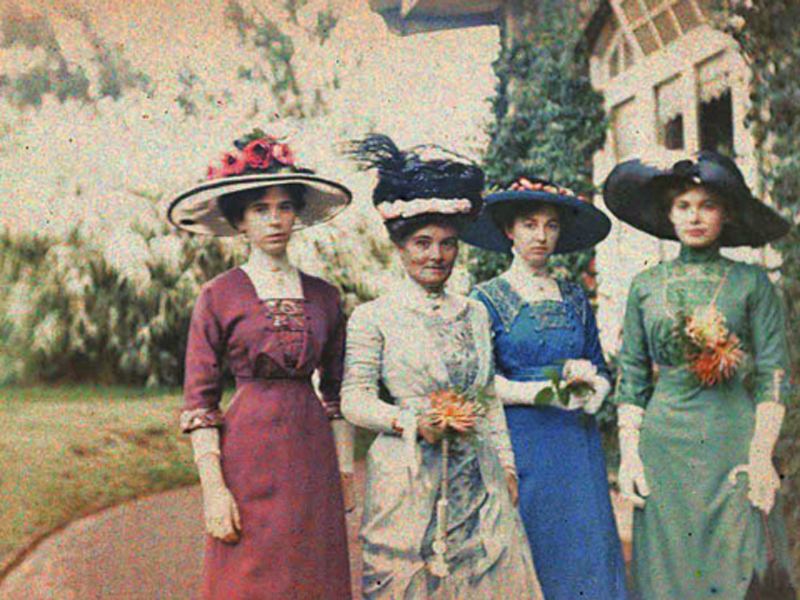 It was the most popular way to take color photos in the early 1900s. Auguste and Louis Lumiere patented a color photography process called Autochrome Lumiere in 1903 (they also invented the cinématographe in 1895). The process involves light passing through glass plates covered in tiny grains of colored potato starch, according to the National Science and Media Museum in the UK. The Lumiere brothers held the first public demonstration of their invention in 1907 and began selling autochrome plates shortly thereafter, making color photography more widely available than it had ever been before. Etheldreda Janet Laing studied art in Cambridge and became an amateur photographer, often using her daughters as her subjects. 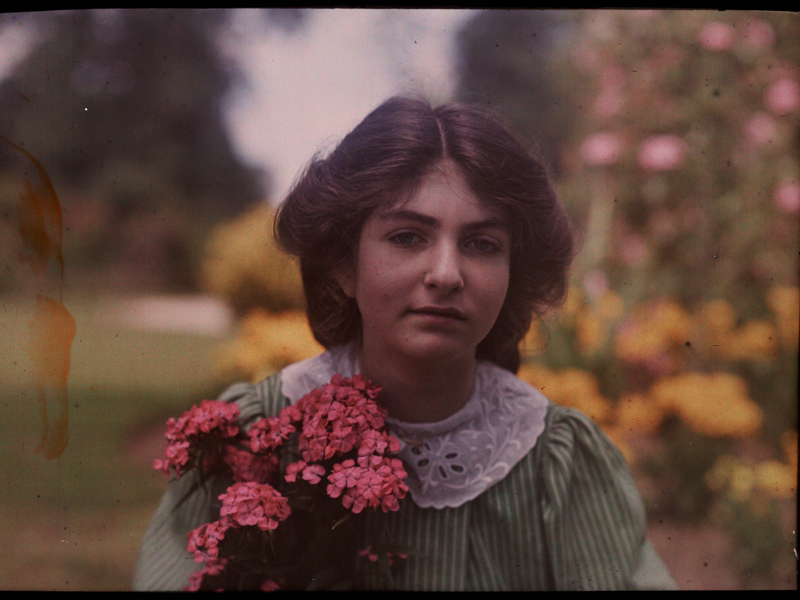 She took a series of autochrome portraits of her children in the summer of 1908, set in the garden of the family home known as Bury Knowle. She photographed her daughters wearing sun hats on the balcony. The younger daughter is holding a stuffed dog. 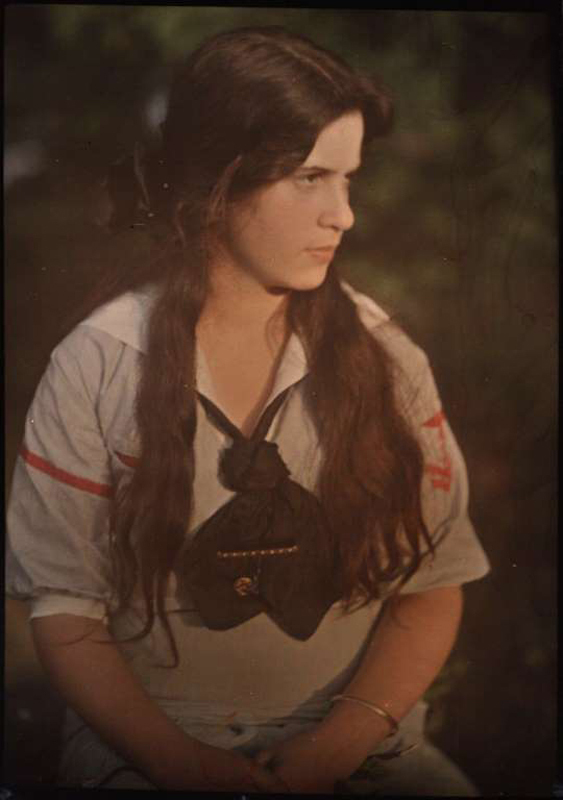 Alfred Stieglitz often featured his daughter in his portrait work as well. Yale's Beinecke Rare Book and Manuscript Library writes that this photo could possibly have been the work ofEdward Steichen or Frank Eugene, but that it's attributed to Stieglitz. This couple was photographed in color around 1910. 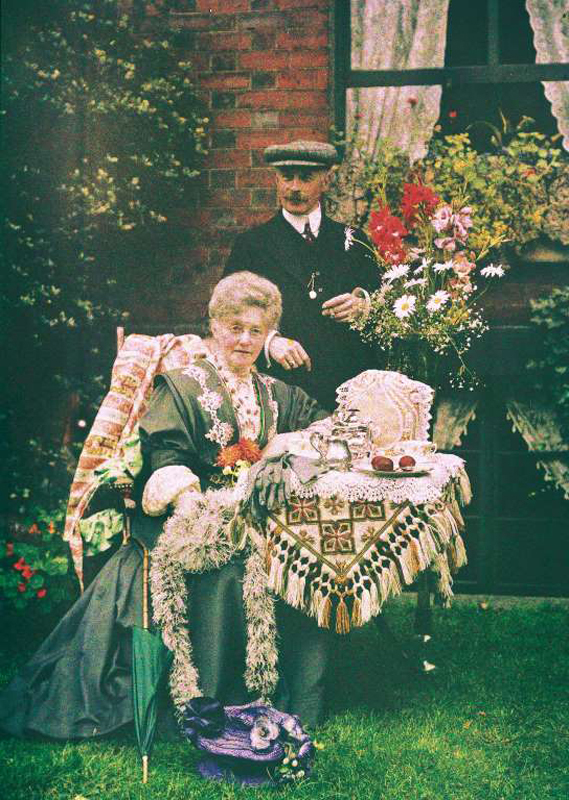 They were photographed having tea in their garden. Two farm workers were photographed sometime between 1910 and 1915. 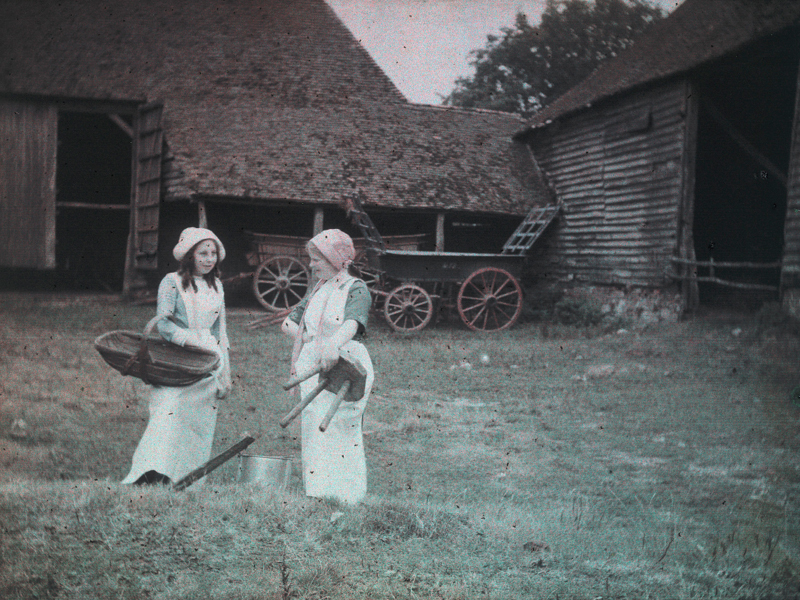 The woman on the right is holding a milking stool and has a bucket at her feet and likely worked as a milkmaid. 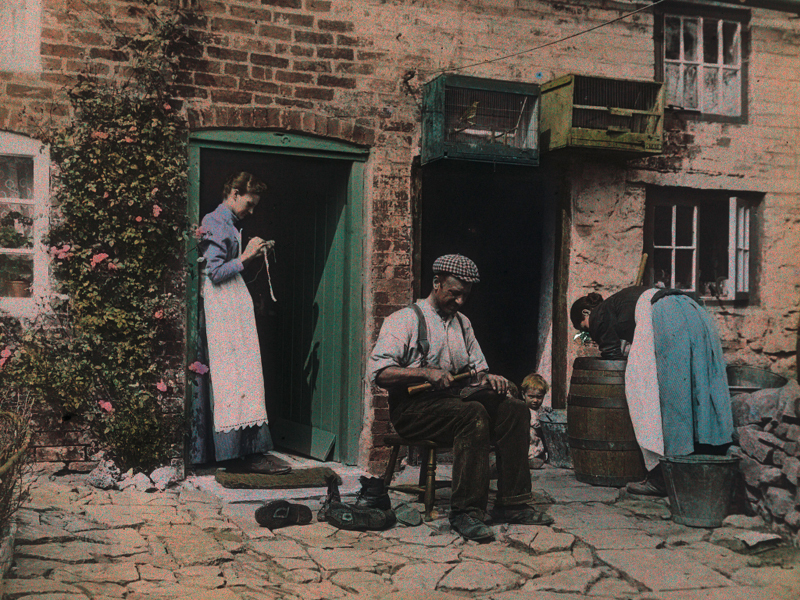 Arthur E. Morton, honorary secretary of the Society of Colour Photographers, photographed a cobbler in 1912. The cobbler is repairing the soles of old boots while the woman on the left crochets. Morton captured the charm of a country home in Worcestershire. The house later became a prison, according to Getty Images. 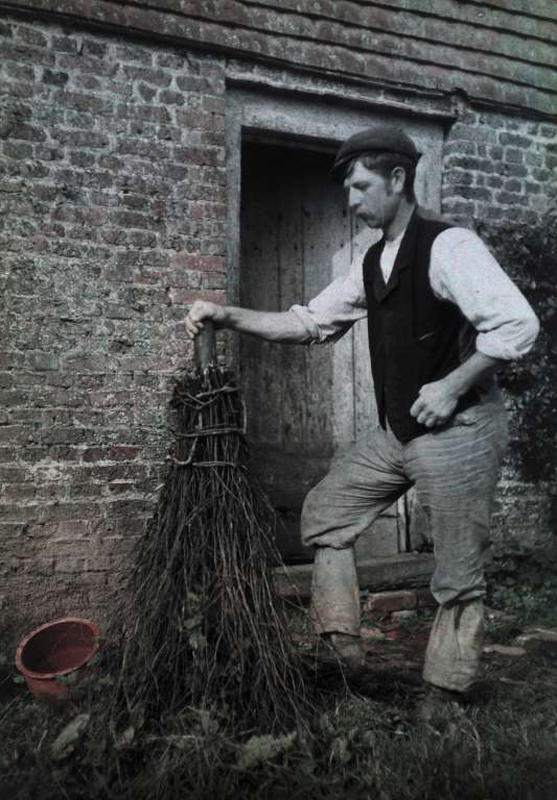 He also photographed a man posing with a besom. A besom is a broom made of twigs tied together. He dabbled in still life photography, too. 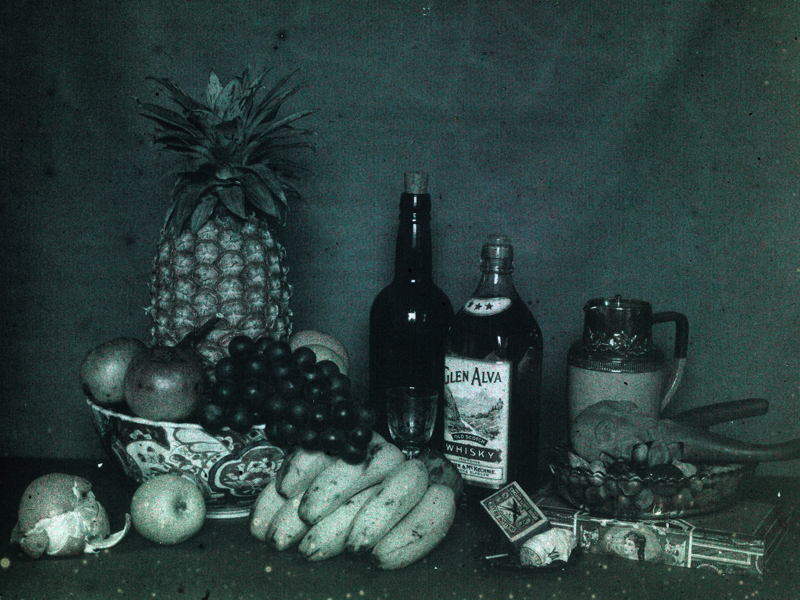 Morton photographed fruits and drinks in a still life portrait. 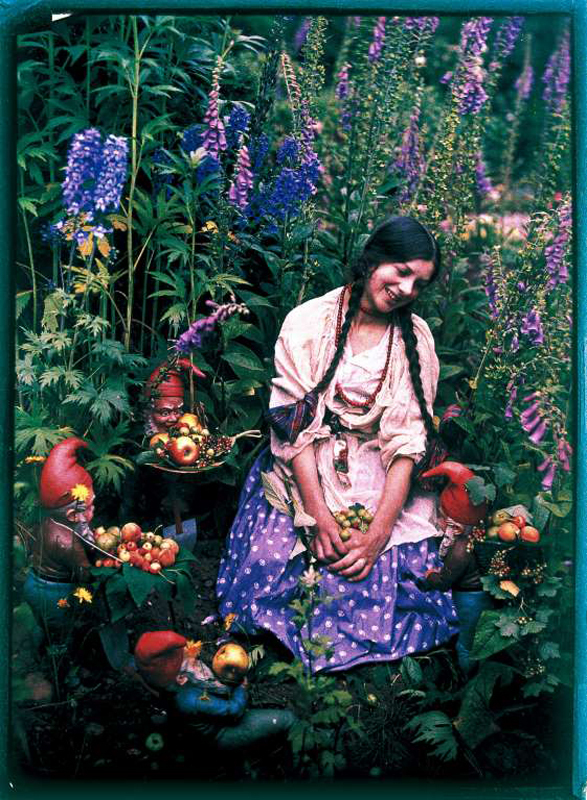 This portrait by British amateur photographer Emma Barton, also known as Mrs. G. A. Barton, shows a woman sitting in a garden surrounded by colorful flowers. Barton is best known for her photo "The Awakening." She first exhibited her work in 1901 and was featured in various publications. 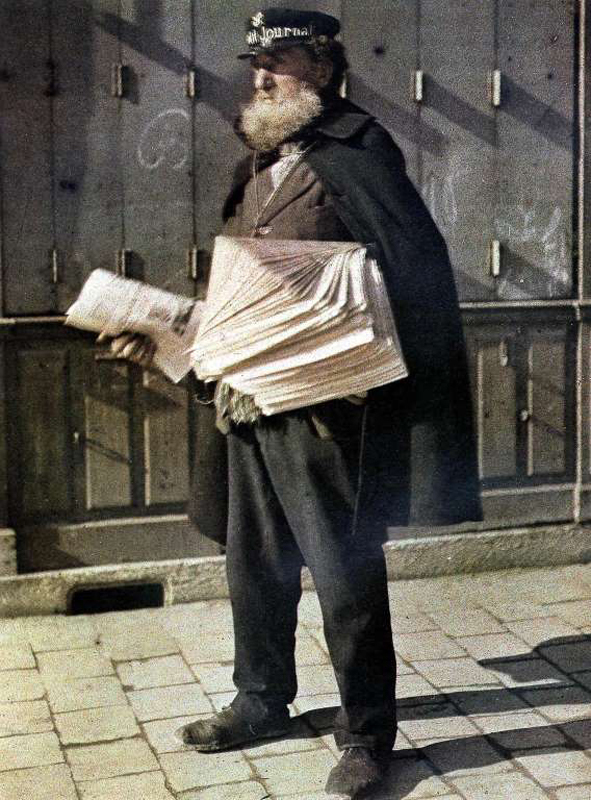 A newspaper seller was photographed on the streets of Reims, France, in 1917. Back then, that was the only way to read the news. 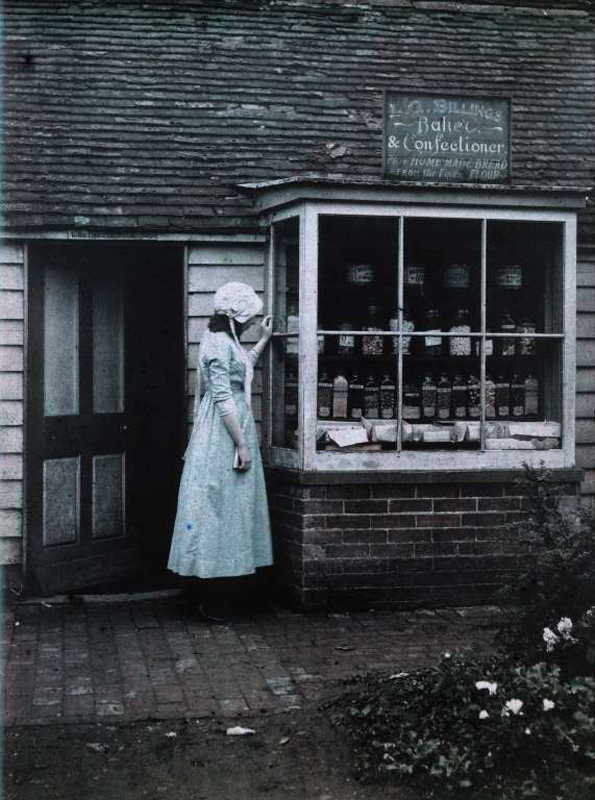 A girl is shown peering into a bakery and confectionary called Billings. The photo was likely taken in Billing, UK. 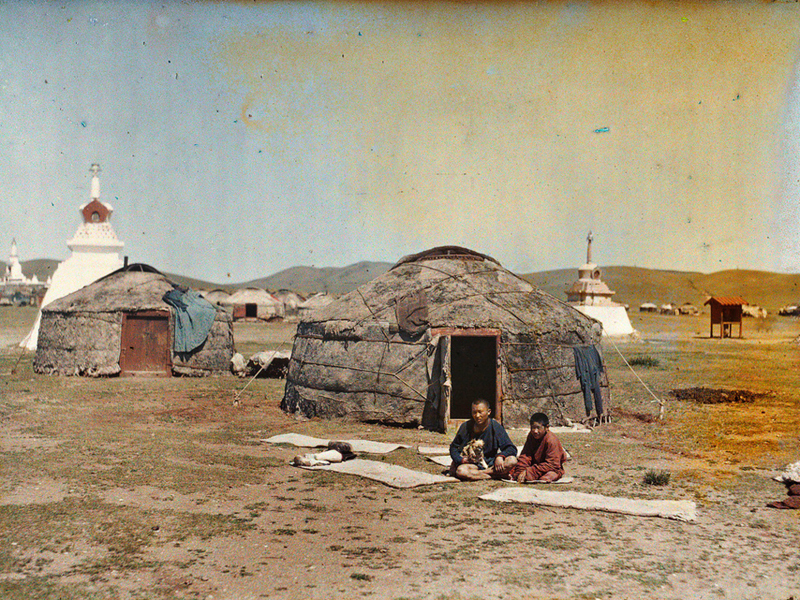 A Mongolian yurt was photographed in autochrome in 1913. Not much else is known about this photo. 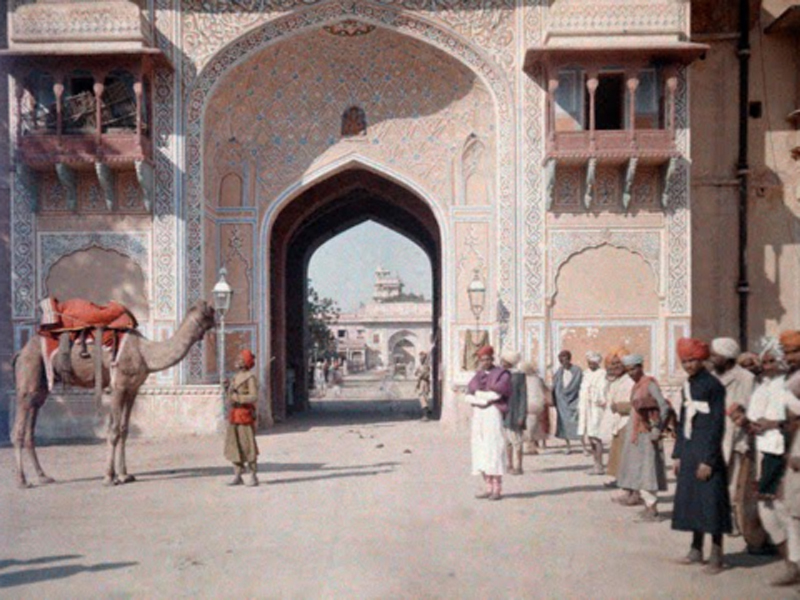 Here's what the entrance to the Maharaja's Palace in Jaipur, India, looked like in 1926. The palace is now a hotel. 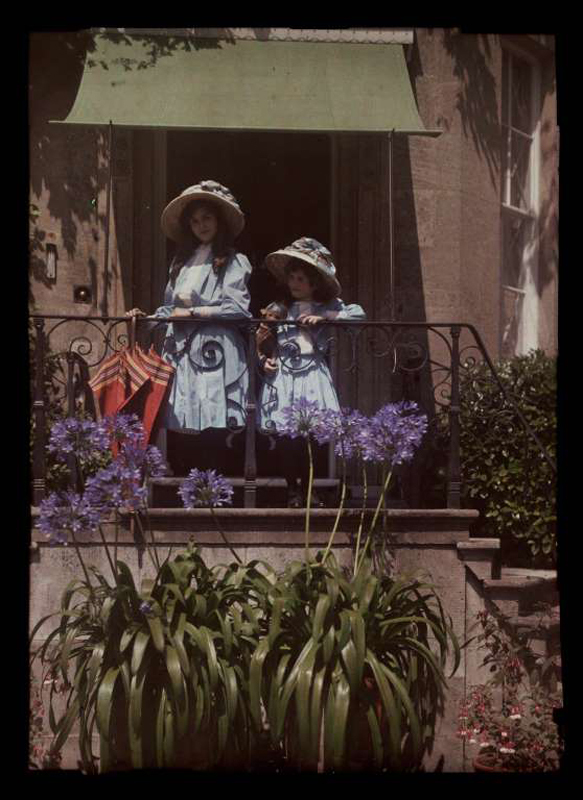 William A. Gullick photographed his wife and daughters wearing different colors at home in Sydney, Australia. 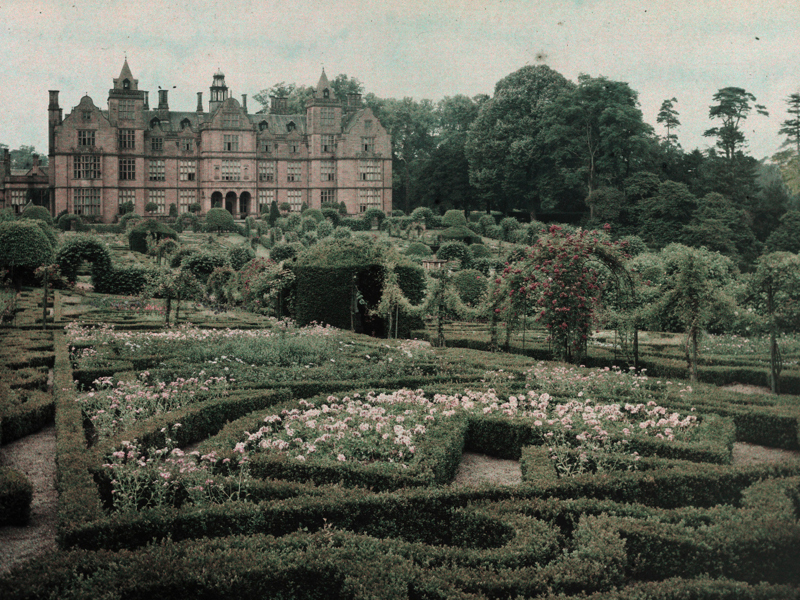 Gullick worked in printing and became an amateur photographer when autochrome plates became available. 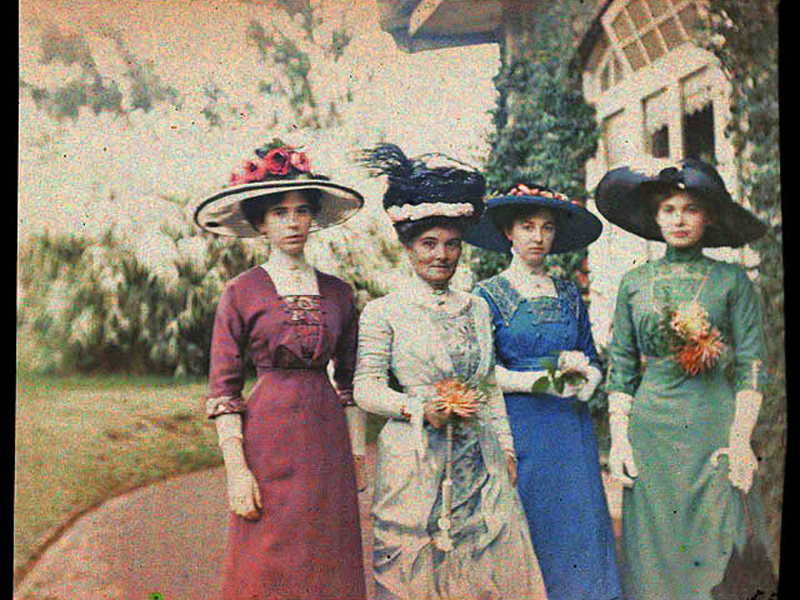 Pictured are Mary, Zoe, Marjory, and Chloe Gullick.